Subtlety is the name of the game in the world of concealed carry and DeSantis' N15 E-Z Rider® II Day Planner Holster fits the bill. 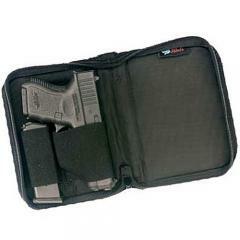 DeSantis uses the disguise of a day planner to create an understated gun case for Glock 26/27 or similar medium-sized weapons plus an extra magazine. DeSantis constructs the holder from 1050D ballistic nylon fabric for durable, long-lasting performance. The E-Z Rider® offers a paddle for belt compatibility as a convenient carry option. NOTE: Select your weapon from the drop down list to ensure proper fitting. Unlisted firearms are not compatible with the holster.